It’s an Ina quote that should sound familiar to those of you who have watched her shows on Food Network for the past 14 years. 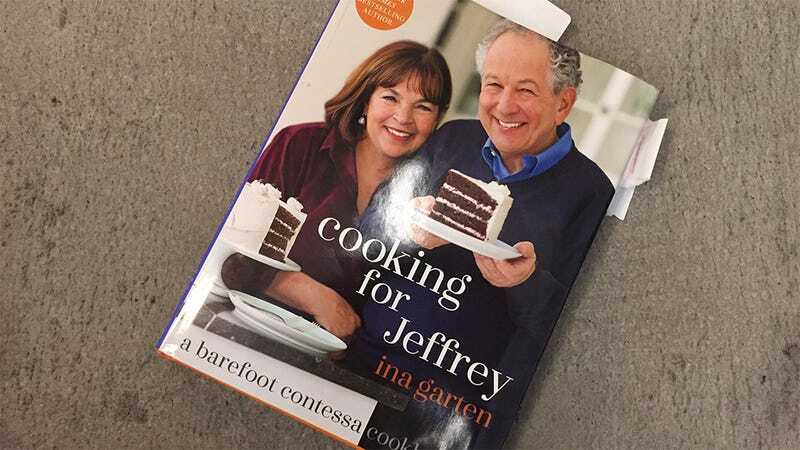 Jeffrey Garten is a constant presence on Barefoot Contessa, whether he’s on camera or just being referenced by his wife. Jeffrey loves this chicken recipe. Jeffrey loves this dessert. Jeffrey loves me. So it’s no surprise that a book dedicated to her favorite person in the world exists. What’s surprising is that she made nine others first. Garten has spent the past 17 years publishing cookbooks and starring in cooking shows (plus 12 before that running her fine foods store, The Barefoot Contessa), but what sets her apart from her Food Network peers—what’s given her such a cult following among people who don’t even like to cook—is her lifestyle. I’m not just talking about wealth, either, but something that can best be described as shameless contentedness. Alton Brown could talk down to you while hovering over a prison hot plate. Guy Fieri could cook his meals in a dirty garage and attract viewers. But it’s hard to picture Ina not floating zen-like through her stark-white, East Hampton version of mecca. Her food looks as professional as Julia Child’s, and her voice is as smooth and comfortably upper-class as Lauren Bacall’s (is that a weird thing to say? ), but instead of groaning at her perfect-seeming life or seething with jealousy and angrily switching the channel, her viewers (myself included) are comforted by this sometimes overwhelming display of plenty. Yeah, she’s a little out of touch (she once referred to the Hamptons as mere “weekend houses and farm stands”), but entirely lovable. Oh, and everything she makes looks incredible. Ina exists in another world—one that comprises of a single bit of self-sufficient East Hampton coastline that orbits its life-giving star: Jeffery. Which brings me back to her new book. Every section begins with a short essay about an important milestone of their decades-long romance, and acts as proof that the relationship they love showing us onscreen is, in fact, the real deal. There’s the story about how they met (she was 15, he was a freshman at Dartmouth), the moment she fell in love with food (while they were newlyweds camping in France), and why she opened her original store, The Barefoot Contessa (because Jeffery inspired her). According to her, she’s everything she is...because he loved her. Combined with the recipes—which range from quick appetizers to complicated dishes that that require more kitchen appliances than I’m able to afford—make the book aspirational in a grander way. Any fancy cookbook can make you daydream about a Nancy Meyers kitchen, but this one makes you envy its author’s state of being. After reading Cooking For Jeffery, I wasn’t just hungry for a raspberry rhubarb crostata (p. 205) or camembert & prosciutto tartines (p. 51), I was desperate for Garten’s blissfulness—which is so palpable it almost makes me sick. God, this woman seems happy and fulfilled. In the introduction, Garten describes the act of cooking for someone as an act that says, “you’re important enough to me to spend [this] time and effort.” After trying to cook three of her recipes in a single night, I can say that she’s right. And I had to settle for some of the easier ones. Once I finished flipping through and salivating at all the recipes in this book (arranged in typical cookbook fashion, from cocktails and starters, to entrees, to vegetables and sides, to desserts)—as well as cutting out everything that required a food processor, stand mixer, or ingredient that was out of my price range—I decided on a three-course meal of fall/fall-adjacent dishes: butternut squash & ricotta bruschettas, crusty baked shells & cauliflower, and the aforementioned raspberry rhubarb crostata. The first two called for fresh ricotta cheese—something I’d never made before. Lucky for me, Ina included a recipe. 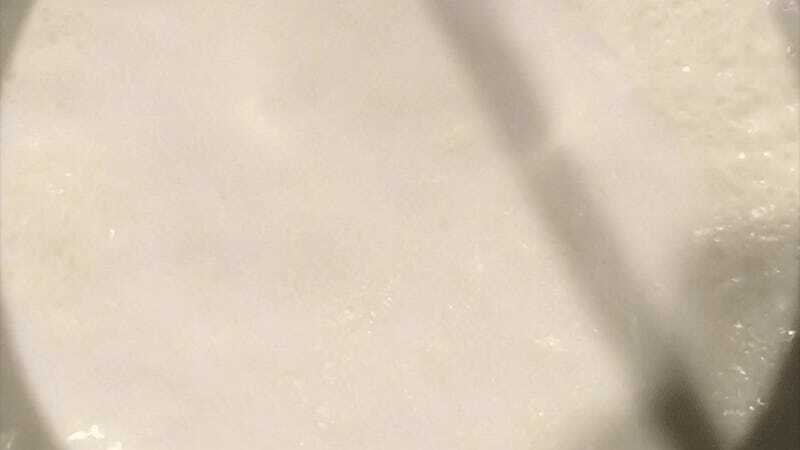 For those of you who, like me, love cheese despite needing to take a Lactaid before consuming large quantities of it, the act of making ricotta cheese (and all cheeses, I assume) is enough to make your intestines want to burst from your abdomen and run straight to the bathroom. Her recipe requested that four cups of whole milk and two cups of heavy cream get hot and heavy in a saucepan, so I dumped the contents into a large one and stirred them until it boiled out of what must have been ecstasy, then added three tablespoons of good white wine vinegar. That’s a joke, of course, as the white wine vinegar I bought was $1.99; but it curdled the milk, which was all that mattered. I expected something to go wrong in this process, as there’s always something nerve-racking about putting milk over an open flame, but my inaugural attempt at being a cheesemonger went off without a hitch. After lining my Ikea sieve with cheesecloth (who knew my grocery store sold cheesecloth? ), and watching it drain into the large Ikea bowl underneath for 20 minutes, I had two cups of ricotta cheese. Friends, it was incredible. Yas, watch that milk boil!!!! Cook pasta for entree, set aside. Chop butternut squash for bruschetta, roast. Chop onions for bruschetta, set aside. Chop cauliflower, sage, capers, garlic, parsley, for entree. Assemble entree, put in oven. Remove entree from oven, set aside to cool. 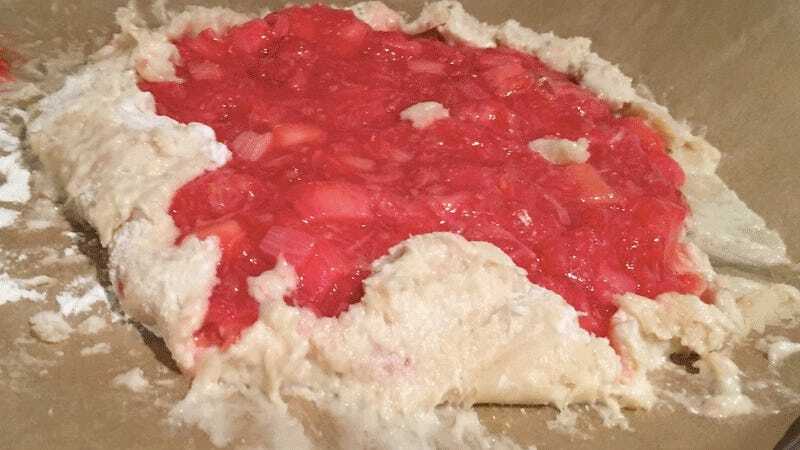 Remove crostata from oven, set aside to cool. While time consuming and plentiful, the individual pieces here were, for the most part, remarkably easy. There were no special knife skills required or intricate methods for assembly, just rough chops and simple layering. The diciest part about the entree was making the ricotta, and the only marginally difficult thing about the bruschetta was peeling the butternut squash, as its thick skin led to fears that I would break my flimsy peeler, slice off the tip of my thumb, or both. Fortunately I just grazed a cuticle, and no blood was shed. The completed bruschetta photographed so well that it made me feel like a food blogger. But the dessert! The dessert proved problematic. Ina defines a crostata as “basically a rustic pie asked on a sheet pan,” which was a big selling factor, as I don’t own a pie pan. But I misinterpreted “rustic” to mean “you won’t need a food processor.” Or, more accurately, I thought it meant “you can definitely use that Nutribullet you got for free for some reason instead of a food processor.” How wrong I was! This is why you’re told to read a recipe twice before cooking it. The thing about pastry crusts, as countless TV hosts have taught me, is that they should be made with ice cold butter and ice cold water. You want chunks of butter to remain in the batter when you flatten out the dough, as some mystifying process allows those separate chunks to melt and make the crust flaky, as opposed to merely crispy. But! The thing about Nutribullets is that the blades get very hot as they spin, so the moment you put ice cold butter beside them, it’s whipped into a sort of sticky consistency that’s somewhere between pudding and wet concrete. But because I had already made the filling, and because what I extracted from the Nutribullet was moldable and resembled something that could be described as “dough-like,” I wrapped it in plastic and tossed it in the freezer to cool. Maybe that would help! After successful finishing the the savory bits of my meal—which took about two hours, give or take—I hesitantly retrieved the ball of dough from my freezer. It was sticky and gross, like something I would make fun of on The Great British Bake Off (“Drag him, Mary! Be savage, mom! !”), but I couldn’t just throw it out, so I made a deal with myself: If it spread out to the required 12"-diameter circle, I’d bake it. If not, oh well, I’d eat the filling with a spoon. Because the stickiness worried me, I decided to cook it on a parchment paper-lined sheet pan, and rolled it out (with a bottle of wine) directly on top. After spooning on the filling, I folded over the dough to the best of my ability (as I keep repeating, this stuff was sti-cky). Once the dough cooked and the butter melted, it released itself from the parchment paper and was actually quite easy to slice and serve. Too bad it was hideous. So. After hours of cooking, I was two for three on presentation, but three for three on taste. The bruschetta, with its finishing touch of apple cider vinegar cutting oh-so-pleasurably into the fresh ricotta, was one of the tastiest, most impressive appetizers I’ve ever served. The cauliflower/pasta thing was filling and flavorful, and the fresh sage and caramelized cauliflower made every bite feel appropriately autumnal. And the crostata? The crostata had a sad, character-free crust, but at least it wasn’t (burned on the bottom). I topped it with Reddi-whip. In my kitchen, we call that “good” whipped cream.